The weather getting hot and hot day by day with the arrival of June. There have been BOSIET course from May 31 to June 2, HUET course on June 1 and FOET course on June 3 here in NSTC. The delegates made every effort to acquire the competence with their earnest eyes. The photo below is one of the scenes of their earnest training. As the weather heating up, donning fireman’s outfit and helmet, there were delegates wearing orange fireman’s outfit challenging firefighting training with full of passion more hot than the fire. 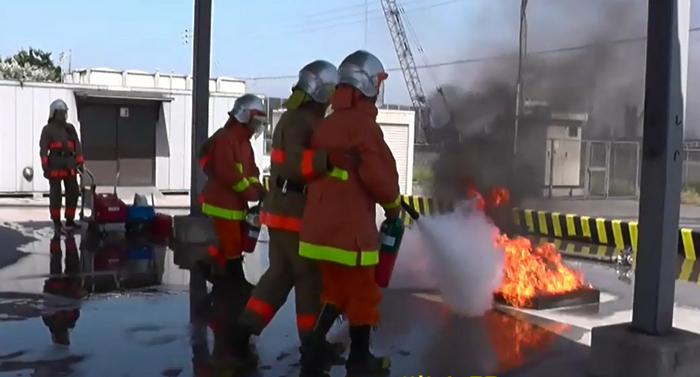 The training staff (wearing yellow fireman’s outfit) confronted against delegates’ hot passion. As it will be summer time, it goes without saying that we will prepare for the heatstroke, but moreover, we would like to respond with a lots of “passion” to delegates “passion” so that we won’t suffer heatstroke because of hot passion of the elegates. Here are some comments from the delegates. Thank you very much for many viriety of comments.